Quote of the Year. “I am money on all signatures holes” – Jr. Self-proclaimed after a near miss ace on Streamsong Red #7 on 12/5/16. Guiding Principle #1 – Stay in the moment and enjoy the moment. No cell phone allowed on the golf course during a golf trip. Guiding Principle #2 – created from 12/4/16 – 12/6/16 “Play like a pro.” When the opportunity presents itself, use a caddie, especially on vacation. The Rules of Golf an Angry Golfer. Commissioned by Junior on March 15, 2015. Rule 19 – the original rule. Also known as the “McHale Rule”. Was put into effect on Tuesday August 19, 2014. 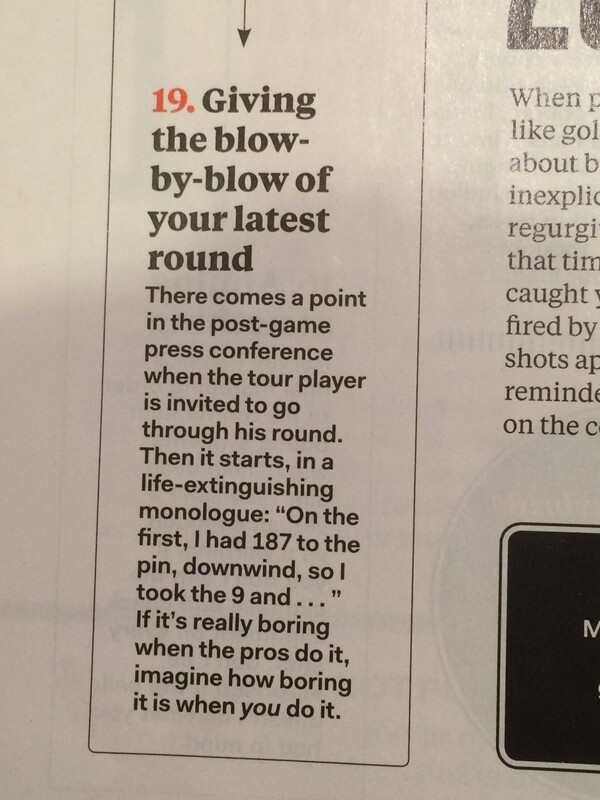 It first appeared in the August 2014 Golf Digest. Rule 20 – in response to Rule 19. McHale created Rule 20 because he was angry about being a constant violator of Rule 19. The rule states, no talking about little league baseball during a round of golf. This rule is never followed. Rule 21 created March 14, 2015 – Created by McHale in response to losing a match on the 18th hole of Choctaw. Walsey birdied, McHale bogied. The rule states, Quit reliving holes that made you money. Rule 1 created March 14, 2015 – created 5 minutes after Rule 21. The rule states if you make the putt (from the match on March 14, 2015) you would not have to create Rule 21. Due to Rule 1, Rule 21 may be nullified. A vote by the players is required. The rule states …..Dustin is a jerkoff. Deal with it. Turkey Ruben, Toasted rye, no butter. With no thousand island dressing. Trying to keep it healthy.